With the help of some Twitter friends I found a frame large enough (and cheap enough) to fit this print that has been rolled up in it's original mailing tube for three plus years. It's shiny black plastic, which paired with the hot pink print makes it feel a little like it belongs in a teenager's bedroom. I would have preferred a natural wood but you work with what you have, right? I may take some sand paper and black matte spray paint to it and see if that helps. 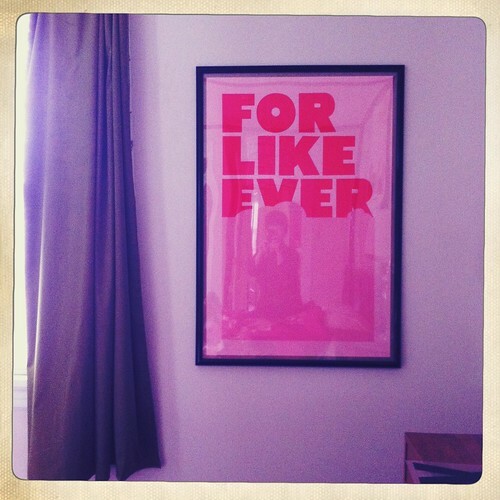 Otherwise, I'm really happy to finally have it on display in our bedroom. There's a lot of pink in there now but Brett can handle pink. I like that about him. I'm not sure if this print is still available online but I bought it from ReForm School. Here's one of my current favorites from their print selection. And these two. I need more walls. where's this print from ? very cute! I found it at Reform School awhile ago. Not sure if it's still even available. any way you could cover it with the wood grain contact paper-- using long strips with mitered corners? I tried to find this print in natural a while ago for baby's room...but it's out of print at Reform School. Boo. The pink is very cute--and congrats on getting it up! OoooOo I think I found a new favorite site! Love it! I have a 'Keep Calm and Carry On' poster that has also been rolled up in its original packaging for way too long because I haven't been able to find an affordable frame to put it in. i love it. just having it on the wall is perfect. The frame was from Michaels craft store. this print is soooo cute!! hi Rachel, i wrote an e-mail to Leigh-Ann about sponsoring/advertising on your blog, its few days later and she didnt write back.. should i write to you? The photo is cooler than the print because I can see your reflection in it. I'm not sure if anyone else noticed that but it's a really cool photograph. And the black is hot. You should leave it. It will make ya feel like a teenager again! *LOVE* this print! We also have this print hanging in our bedroom, we used a large white wooden frame from ikea I believe it was $25.00 which was a great price point! Yours looks lovely too! I'll never forget this cover! love, LOVE IT!! i second the woodgrain contact paper idea...should work wonderfully! Yes, feel free to send me an e-mail. Thanks! Looking forward to having you! Also, I'm really thinking hard about wood grain contact paper but blonde contact paper is hard to find unless it's in bulk. I'll experiment. this is my first time commenting. I love your blog. I have that same print. I bought it back in 07 and it took me 2 years to find a frame that was light wood and big. I finally did at Aaron Brothers. I spent $40.00. They might still have that frame. I too have this print-- rolled up in it's tube from around 3 years ago! haha! you may have inspired me to break it out! I LOVE that print. so rad. oh this print has been on my wishlist since seeing it on the cover of domino all those years ago - it is so pretty!! I think it is available through super-rural.com in several new color ways...but of course pink is the best :). Looking forward to the house tour Rachel your style is one of my favs! I just got this one for my birthday!!! It's still for sale, on super rural.com Or google "for like ever village"